Watum Solutions BV (Watum) was founded in 2001 by Mark Olthuis. Watum is specialised in designing, installing, maintaining and supporting IT networks and VSat (SatCom) systems on ships, offshore platforms and in support offices on land. 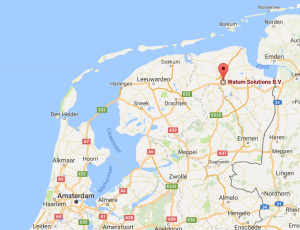 Watum supports its clients all over the world in the key regions of Europe, West Africa, the Mexican Golf, the Caribbean and the Middle East from its site in Groningen. Watum would like to help its clients improve their IT systems on board and increase the availability of critical internet systems, not only on new ships, but also for refits. No matter the case, it is important to work with you, preferably long before laying the first cable. Our philosophy is to take the worry off our clients’ hands where possible by providing the best possible level of service and by focusing on a long-term relationship. Some of our largest clients have been with us for more than ten years. Watum currently employs 11 professionals. All Service Engineers have the necessary SeaTel , Sailor, offshore certifications and health certificates for working on board and for transport by helicopter. Our sister company 'Watum IT & Telecom' is specialised in IT, VoIP and internet solutions on land for the office organisation and provides the same level of quality that we are accustomed to from Watum for the offshore oil and gas industry. Our company gets its name from the old lighthouse located at the mouth of the Eems, in the heart of Watum, a few kilometres to the north of Delfzijl. This lighthouse was lost during the battle at the end of World War II. Just as lighthouses were vital beacons in the centuries before ICT, Watum wants to be the same, now and in the future.